Idioms are some of the most difficult parts of language for a foreigner to learn when attempting to grasp a new foreign language. Idioms are an important part of the language since they have a strong relation to the culture of the land. The meaning of an idiom in the mother language and culture has a completely different meaning than the literal definition of the phrase. Every language and culture has its own set of idioms, and the Filipinos have their own idioms as well. Tagalog is one of the many languages spoken in the Philippines. The following are examples of Filipino idioms shown as a list of Tagalog phrases, along with the the literal meaning and the colloquial meaning of each. Bungang-araw or sakit sa balat literally means "fruit of the sun." When used in conversation, the phrase means prickly heat. Bungang-tulog is literally "fruit of sleep." But when used in conversation it signifies or refers to dreams. Buto't balat literally translates to "bones and skin" but is an idiom meaning malnourished (Skin and bones is also an American idiom for someone who is very skinny or malnourished.). Makapal ang bulsa translates to "thick pocket" and is used to describe a person with a lot of cash in their possession. Butas ang bulsa is someone with no cash but literally means "hole in the pocket." Mabigat ang kamay describes someone who is lazy but is literally translated as "heavy-handed." Magaan ang kamay literally translates to "light-handed." The conversational meaning is quite different. It is used to describe someone that is easily provoked and/or easily hits another person. 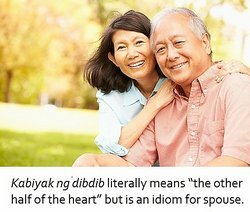 Kabiyak ng dibdib literally means "the other half of the heart" but is an idiom for spouse. Daga sa dibdib describes worry or fear. The literal translation is "mouse in the chest." Bulaklak ng dila has a literal meaning of "flower of the tongue." It is used to denote exaggeration. Makati ang dila describes a chatterbox or talkative person and is literally translated as "itchy tongue." Maitim ang dugo translates as "dark-blooded" but, when used in a conversation, signifies an evil or bad person. The Tagalog idiom referring to the father is haligi ng tahanan which translates as the post of the household and the mother is referred to as ilaw ng tahanan, which means "light of the home." Itaga sa bato refers to remembering forever but holds the literal translation of "cast in stone." This reference is an English idiom holding the same meaning. Matigas ang katawan refers to a lazy person but literally translates to "stiff-body." Makati ang paa translates to "itchy feet," describing someone that enjoys going places. As shown in the above examples, many of the idioms make no sense when translated literally, but many have been associated with a particular trait or characteristic that may be exhibited by a person. Some of the idioms, such as the ones for spouse and father or mother are a romanticized view of the person's status. The last stage of learning a language is to acquire an understanding of the idioms of the language and be able to use and understand them in conversations with native speakers. This ability shows a true grasp of not only the language but also some level of understanding of the culture as well. "Examples of Filipino Idioms." YourDictionary, n.d. Web. 18 April 2019. <https://examples.yourdictionary.com/examples-of-filipino-idioms.html>. Idioms are some of the most difficult parts of language for a foreigner to learn when attempting to grasp a new foreign language. Idioms are an important part of the language since they have a strong relation to the culture of the land.An idiom is a phrase that has a different meaning than the literal meaning of the phrase. In English a few examples of idioms are:Break a leg - meaning good luck or do your bestKick the bucket - meaning diedBull in a china shop - meaning reckless or carelessThe meaning of an idiom in the mother language and culture has a completely different meaning than the literal definition of the phrase. Every language and culture has its own set of idioms, and the Filipinos have their own idioms as well.